If you've ever wished you could add lovely hydrangea bouquets to your cake decorating designs, fondant hydrangea cutters make the job easy as can be. Using fondant cutters is a great way to create beautiful flowers and a variety of shapes and figures to use in cake decorating. While you can purchase cutters specifically designed for use with fondant icing, gum paste or pastillage, you can even use your cookie cutters to create many shapes that work well as cake decorating elements. The most durable fondant cutters are made from stainless steel, but you can also find less expensive plastic cutters that work equally well even if they are more subject to breakage. Hydrangea cutters are essentially fondant cutters used to cut out large numbers of individual flowers to assemble in bouquets.These cutters are available in single petal styles as well as complete blossom cutters. Separate cutters are also available to create hydrangea plant leaves that will really make your designs come to life. There are many places to purchase a set of fondant hydrangea cutters. 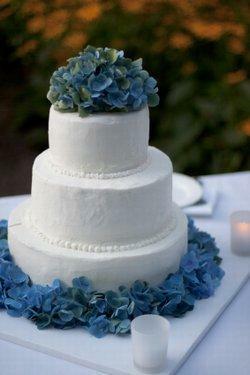 Most cake decorating supply stores will offer hydrangea cutters and have much more available for purchase. If you need a set in a hurry and don't want to wait for shipping, shopping locally may be your best option. The following online retailers also offer hydrangea cutters. N.Y. Cake offers a 6-piece, plastic hydrangea plunger cutter set that's designed for use with fondant or gum paste. The set retails for around $10.00. CakeArt.com sells three different sizes of four-petal cutters as well as a set of individual petal cutters in two different sizes. Each set is made from durable stainless steel. Prices range from approximately $10.00 to $15.00. Using your cutters, follow these simple steps to create professional looking hydrangeas you'll be proud to add to your cakes. Tint your fondant or gum paste the color of your choice using paste coloring. Roll out the dough on a lightly greased cutting board dusted with powdered sugar. Lightly grease the cutting rims of your fondant hydrangea cutters so they won't stick to your dough. Set the individual cutter piece you need on your dough and press down until you feel you've reached the board below. Carefully pick up the cutter, and cut out any other pieces you need that will fit across the surface of your rolled dough. Now, gently peel away the excess fondant or gum paste, taking care not to tear the edges of your petals or leaves. Using a thin flat spatula, gently lift each flower section away from the board as needed as you prepare your pieces for drying and assembly. Now that you know where to find hydrangea cutters and how to use them, don't hesitate to give these lovely blossoms a try. You just might find that they become one of your favorite decorations for spring and wedding cakes.